Rich is one of the top global thought leaders on strategy. His interactive Deep Dive Strategic Thinking Program helped our leadership team not only develop their strategic thinking skills, but also their strategic action/execution skills. His approach was tailored to our specific current business issues and his delivery was practical and easy to grasp. As a result of Rich’s expertise in the realm of Strategic Thinking, Greenstone has become better equipped to handle both short term objectives and our long-term vision. His expert strategy facilitation during our workshops allowed the executive team to realize a clear vision that will have economic impact for years to come. The industry faces exponential change and our work with Rich has positioned Greenstone for competitive advantage. We cannot thank Rich enough for his expert strategy consultation as Greenstone looked to engrain ourselves for long term success. This vision is being realized through a more defined strategic direction and clear vision that will drive our true north as an organization. Rich Horwath did an exceptional job at helping our organization take a Deep Dive into how we were looking at strategy and planning. We learned that we had many definitions of strategy and many throughout our organization. Rich interviewed many leaders and came up with clear recommendations to help us align one common definition of strategy and planning. Since our Deep Dive session with Rich at our National Meeting, we have received feedback throughout the organization that it was the best session they have ever attended. The skills and tools have immediately made an impact. As an example, the GOST model has been embedded into our strategic department plans. The Trade-Off Matrix has helped us prioritize and say no to ideas that are not feasible and would not have an impact on our business. We thank Rich for the impact that he has made on our organization. Rich is a consummate professional in every aspect of his work. He invests time with key stakeholders, actively listens and conducts thorough reviews as he prepares his content. We were fortunate to have him speak to the top 70 leaders at Moen to help reinforce the three disciplines of strategic thinking framework and he did a masterful job. Rich designed and delivered a presentation that offered the right balance between theory and practice which facilitated audience participation and focus. The reviews of the session were outstanding and I would highly recommend Rich to communicate the art and science of strategy. Over the years, I have participated in a number of programs on strategic thinking, including a multi-day American Management Association seminar. All of these have fallen short in comparison to your program. Your expertise in this area is clearly reflected in your excellent course content, design and facilitation. Our Area Sales Directors and our Heads of Sales have all expressed appreciation for your approach to strategic thinking and intend to incorporate your models into their business practices. Thank You. I wanted to thank you for an incredible experience at the Wyndham strategy meeting. Your expert facilitation shone and was a major part in ensuring we stayed on time, focused and most important, productive! The feedback we’ve received on the meeting is very positive regarding your skilled facilitation and relevant content. The tools you provided were practical, useful and will ensure we stay focused on incorporating strategic thinking as part of everyday life and not relegated to an event. I highly recommend Rich if you or your organization want to increase your strategic capability. 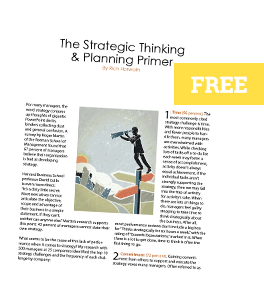 Rich takes the complex topic of Strategy and provides a straightforward framework and practical resources to advance strategic thinking. Rich’s sheer expertise and dedication in the field of strategic thinking is unparalleled. He is truly a dynamic teacher, combining a variety of media to convey valuable concepts and deliver strategy content in a thought-provoking and engaging manner. What separates Rich Horwath from other strategy resources is that he presents the subject is a very understandable, relevant and practical manner. His Deep Dive program is an excellent business resource that outlines a clear roadmap for any manager to immediately improve their strategic efforts. The world’s foremost expert on strategic thinking. We brought Rich in to speak on Strategic Thinking to our group of 150 senior leaders and managers and he “hit it out of the park”. Aside from his delivery being very engaging, his message resonated with everyone in our conference and every single person walked away with tools and techniques that they’ve committed to applying back in their organizations. Rich Horwath does an exceptional job of quickly understanding your business and then applying the most effective and efficient strategic tools to add significant value to the organization. I would very much recommend Rich to any leader that is looking to improve their strategic thinking, planning and execution to help enhance both top and bottom line. His Strategic Counsel was a great experience!! Thank you very much for leading our strategic planning process–it was outstanding. The tools you shared are easy to use and at the same time get to the issues ‘so what?’ and ‘what now?’ Thanks again for an excellent program. What Rich did here today was extraordinary. He gave us a new process to think. Rich was the most effective speaker at the National Conference. He is smart, focused, warm, connecting and stimulating. The room was electric during his talk. If you had been responsible for the success of this conference, and if every scheduled speaker had fallen overboard the day before it started, and if you had only one rope, you would have saved him first. I wanted to thank you again for delivering your Deep Dive Strategic Thinking program to our group. It truly was one of the best developmental programs I have been through! You have an amazing gift of not only delivering your expertise in strategy that makes it easy to understand, but doing so with enthusiasm–very engaging. We emerged from our time with Rich with a shared understanding of strategic vision, a desire to engage in necessary allocation conversations, a clearer understanding of our position within our competitive set, and a set of tools that will serve as living strategy documents. Rich is not only an extremely competent thought leader regarding business strategy, but is also an amazing facilitator and presenter. His ability to create a space in which critical insights are both encouraged and required and his sincere desire to see that the teams with whom he engages are successful is readily apparent. I consider myself fortunate to have had the chance to work with Rich and would recommend him as a trusted advisor to any teams about to embark on a Deep Dive of their business strategy. COUNTRY Financial recently engaged Rich Horwath to lead its strategic review and planning session. We were not disappointed. Rich brought high energy and excellent methodology to this process. His deep understanding of strategic thinking, combined with his strong facilitation skills, lead to lively discussion and allowed us to reach consensus on clear direction and prioritization for our coming year. Thank you so much for your great professional development program on strategy at the Lockheed Martin Aero Leadership Summit. The feedback from the participants was great and included comments such as, ‘Rich Horwath’s Strategic Thinking Program provided the resources to become the strategic leader I want to be in the future. Rich’s Deep Dive Strategic Thinking program was perfect for our needs to provide professional development on strategy. He went above and beyond to tailor his Deep Dive Strategic Thinking workshop to fit our business challenges. We asked for a highly relevant and interactive session and he delivered. I have been in the pharmaceutical industry for 15 years and felt the day with Rich was priceless! I STRONGLY recommend this workshop to anyone looking to advance their strategic thinking skills!! Rich is an exceptional talent and one I look to for expert advice on business strategy. Rich brings an astute knowledge of strategic thinking to the C-level attendees in the audience, and provides a clear action plan for how they can incorporate these principles into their daily activities to create a competitive advantage. From his content to his delivery, Rich’s presentations are impeccable. I have never been more impressed with a keynote speaker. The Wharton program on Strategy was 5 days of theory with very little application. Your Deep Dive Strategic Thinking program was much more of what I was looking for: 1 day of using practical tools to help develop a strategy. I can envision using what you taught us immediately with my team for next year’s planning. Your Deep Dive Strategic Thinking workshop was very effective at introducing planning concepts I am now using to develop strategies at FedEx. Your strategic concepts are universal for most product and service applications, and by providing about 10 concepts, we were sure to walk away with at least half of the concepts that we can apply to our specific work. By first introducing the concept, then providing us examples with different types of media and third allowing us time to apply the concept to our work, this three-touch process insured we understood the concept and how we can apply it to our work. Your ability to gain participant participation was effective with open probes that centered on examples from our work, again applying the concept to our work. In addition you had done your homework on FedEx and timely communicated that knowledge to us during your presenting which dramatically increased your credibility and competence with the group insuring we listened to your presentation. After evaluating and writing skill development training, and facilitating programs for four years to sales teams, I found your Deep Dive Strategic Thinking course to be skillfully facilitated and concepts to be vital planning tools for most applications. Every senior executive who attended the Strategic Thinking for Competitive Advantage Workshop felt the workshop was extremely valuable. Through a series of activities and modeling, Rich’s workshop provides the tools for strategically thinking through the business and channeling the resulting insights into an action plan to achieve an organization’s goals and objectives. The C-Level executives rated Rich’s content and effectiveness as a presenter as ‘excellent’ across the board. I appreciate the Strategic Thinking Workshop you just completed with my team. You presented easy to understand strategy concepts with practical ways to implement prior to our yearly planning meeting. I will use these ideas to help our team develop true strategies versus the annual tactical process we all have to guard against. Again, thank you for a great session. Rich does an excellent job in assisting individuals throughout various levels of an organization understand that while strategy is a somewhat abstract and intangible concept, there are a variety of tools and methods available to practically apply it to their business. His presentations and workbooks are thoughtfully constructed, understandable and useful in leading a group through a comprehensive and objective analysis of their business that ultimately results in action plans focused on differentiating themselves from the competition. His grasp of the topic of strategy along with a comfortable and upbeat presentation style is effective in facilitating strategic thinking and strategy skills development. Your strategy program was inspiring and right on point. My team was able to take the strategy concepts and tools you presented and immediately apply them. Your practical explanation of the intangible strategy concepts made the difference. I believe that all participants left this week as better strategists. From a marketing perspective, the Deep Dive Strategic Thinking Program was one of the best developmental programs that I have attended in the last 28 years! Additionally, I think this is a type of class that should be offered to all marketers regardless of how long they have been in marketing. We invited Rich to come in for the last several years to kick off our annual strategic planning process. Our strategy development group has integrated his strategic concepts and tools into our strategic planning process. These concepts and tools have helped to develop a comprehensive framework that has promoted strategic thinking throughout our organization, with the goal of continually developing new strategic insights and generating new growth. To close our IT Summit, we chose Rich Horwath to give the keynote speech to our customers, partners and team members. Rich did a FANTASTIC job and everyone felt that he provided very good tools, ideas and strategies that companies need to stay ahead of trends and help them grow their businesses. Rich, I wanted to let you know how much I appreciated your presentation to our officer group. You did your research to understand key points about our company and about our distribution channel. You delivered your important topic, all while keeping your audience in mind. You were careful to not offend or discourage anyone who has worked long and hard to create strategy to help us continue to be a thriving company into our 100th year. I’ve listened to many speakers who thought it their mission to make us uncomfortable to bring about needed change. You took the approach that you might have some good information to help us grow beyond where we are today. I learned a lot from you, as did many others I talked to. I’m looking forward to the change and growth we can create by incorporating your principles. Thanks for taking the time to learn about us and help us move forward even stronger. The most important insight I gained from the entire summit has to do with your breakdown of what strategic thinking really is. Understanding these basic components helps not only in business, but in every aspect of life. Having such powerful tools re-energizes long term goals by pointing out how they can be achieved and inspires me to start taking the steps that will get me there. Thanks Rich! It’s a new way of life! Rich delivers strategy content in a way that makes it easy to understand. He is approachable, knowledgeable, and motivating. He provided practical tools to guide the implementation of the strategy concepts by people at all levels. Your work had a dramatically positive impact on our business. In addition to the strong strategic plan we developed, you infused a new mind set into our organization that has created the strategic discipline to make important trade-offs and has unleashed a powerful energy of confidence. You’ve truly made a difference to our business. Thank you for facilitating an outstanding strategic thinking session with our top CEO customers within our industry. The CEO’s believe that the program provided them with tools that will allow them to be more effective strategists. In addition, we received a lot of praise about your knowledge in the field of strategic thinking and your ability to deliver the information at the right level. Thanks again for a great program. Rich presented one of the best strategic classes the organization has ever provided. The content was realistic, actionable and he is a credible expert in the content. Rich was a great professor in that he articulated the content in a simplistic manner for all to understand and follow. Excellent program and workshop. Rich is able to explain complex ideas in easy to understand terms and actions. Rich brings a true expertise to the subject of Strategic Thinking. Participants will leave the workshop eager to transfer their new knowledge into actions. Rich Horwath helped us take all that is typically generalized by “strategy” and turn it into practical solutions for our management, and eventually, our entire company. In a relatively short timeframe, Rich helped us utilize a common set of tools and a common language to develop a consistent strategic understanding throughout our organization. We now have a repeatable process to capture key business insights, ensure strategic alignment, develop the company’s leaders of tomorrow, and most importantly, profitably grow our business. Rich did an outstanding job working with our strategic team. He allowed us to explore, question and learn, all the while pushing the team forward to meet our goals. Rich’s skill in facilitation and leading teams is key in delivering his concepts on strategic thinking. He is creative in the approach and development of thinking tools but not intrusive. He encourages his clients to build the strategic process themselves, draw their own conclusions consistent with their business and follows up to make sure they are ‘living the process.’ I would recommend Rich to leaders who want to build strategy and want value for their investment. I certainly thought that the strategic thinking session was extremely beneficial both in terms of practical value and thought-provoking ideas. Your communication style, coupled with the insights and approaches covered in your books are key to today’s answers to ‘how do we stay competitive?’ and “how do we grow?’ Confident that I speak for everyone in the program that the value gained from your strategic thinking experience and approach really will serve The Jones Group quite well in its endeavor to increase profitability and maximize results. The senior executives were very pleased with your workshop on strategic thinking and it was very effective in generating insights. Rich created a strategic thinking mindset for my senior staff. Rich helped my staff take our organization to the next level of Strategic Thinking. Rich accomplished this with his style and real world examples grounded in reality and achieved best practices. This was easily the most relevant and beneficial class I have attended. My learning’s were applicable and sustainable. Rich took our group through a variety of strategic exercises and templates that really flushed out a great deal of insights on our business, our customer base, our competition and the market environment. He then transformed this information into a very credible and most optimal strategic positioning for our business. Throughout the process, Rich was a leader, listener, presenter, facilitator, team member—in essence, he played whatever role was necessary to get the job done in a very tight timeframe. For the next strategy/marketing project I have that needs outside assistance, Rich will be the first person I call. Rich has a great stage presence, prepares meticulously, and executes his remarks very effectively. Securing Rich Horwath for our keynote presentation and full day working session with association chief staff executives in July was the best decision I’ve made in a long time. He was superb to work with in preparing for the event and then gave such dynamic presentations that people were leaving wanting more. Rich is a true professional who delivers energetic, impactful and practical workshops and seminars. Rich’s Deep Dive Strategic Thinking program provides a framework that is easily understood and applied for immediate results. Rich presented a program on strategic thinking at Association Forum’s Annual Meeting for CEO’s and senior level association executives. His program was very well received and numerous attendees expressed interest in hiring him to do work for their organizations. I highly recommend Rich as a presenter and educator! I wanted to thank you again for the outstanding Deep Dive workshop you conducted with my team last month. The feedback has been nothing short of outstanding. We were particularly impressed by how well you knew our business and applied the principals laid out in your book to the current issues we are facing. Also, the team walked away with a new sense of empowerment to say “No” to the many competing demands and really focus on those that would create a distinct competitive advantage for our products. Again, thank you for your time, energy and especially for your expertise. This was one of the best investments we have made in the development of our team. Thank you for delivering the Keynote Speech at our North American Partner Kickoff Meeting. Your session on Strategic Thinking for Competitive Advantage was entertaining, thought provoking and yet practical for a large audience of senior executives. It was exactly what we hoped for and was a big hit with the audience. I wanted to thank you for your superb presentation. For me, it was by far the most memorable, most educational, and most dynamic of all the sessions I attended. You took the complex topic of strategy and condensed it into an easy-to-understand and entertaining event—a task not achievable by many. You are a gifted and dynamic speaker and I am thankful to have had the opportunity to sit under your instruction. Your workshop on Strategic Thinking is an integral part of our advanced curriculum for leadership. The feedback has been sensational! Rich’s strong knowledge in the area of strategic thinking and how it applies to business has been invaluable. He has proved the organization with the blueprint for developing and executing a successful business strategy. I’ve worked with Rich on three separate occasions and wouldn’t hesitate to use him again. Our strategic thinking and planning workshops with Rich have been very effective. The frameworks that Rich uses are very helpful tools that assist with first uncovering, and then piecing together the relevant insights necessary to create an effective strategy. Rich was adept at guiding the team through a process that helped us arrive at a strategy, rather than just having us apply a generic strategy that may have been a poor fit. Your book Deep Dive sparked interest in our officer meetings for the level of engagement and passion it brought forth. Your presentation made it an enjoyable experience while opening many eyes to possibilities of taking the time to plan for the future instead of reacting to it. Thank you. I wanted to take this opportunity to thank you for the excellent workshops at our recent series of Leadership Seminars. These workshops have had instant impact on the organization. We are now using your strategy frameworks throughout the organization. The SWOT alignment approach has strengthened the effectiveness of our team and the Growth Matrix is leading our people to high impact customer solutions. These strategy seminars made a difference and were exactly what we needed to launch our new Market Planning approach. Thank you for the outstanding effort. It will make a big difference in our business. Working with Rich 1-on-1 really challenged me to think about our organization and our current approach to strategy. He asks great, thought-provoking questions that make you pause and think about your next move. There were many tips that I took away that could be applied on a daily basis, such as regularly challenging how we use our resources. Then there were changes that needed time to take root and to show impact, such as our regional business planning approach. To optimize what we were already doing, we embraced the use of multiple Strategic Thinking tools such as the GOST framework, Resource Allocation guide and the Growth Matrix. These tools helped us sift through priorities, define our goals & create a winning value proposition. We exceeded our expectations 12 months later! I have had the pleasure of engaging Rich for over three years for the Sanofi Marketing organization. Rich is a guru of business strategy. His strategic thinking courses are the best I have encountered and have consistently obtained very favorable feedback from Sanofi marketers. His courses raised marketer’s strategic thinking abilities and enhanced the annual marketing plans. I thoroughly enjoyed the Deep Dive Strategic Thinking and Planning session as well as your book. We are working hard to implement the techniques we learned. There is a simple elegance in your strategic thinking framework, and application requires effort to do things differently than we have done in the past. Unlocking the true value of the program will come in the discipline to drive it throughout our entire organization. Most important, it is causing us to think and approach things differently. Huge value! Rich is a gifted strategist and facilitator. He is incredibly adept at relating his strategy concepts and framework to all roles and levels in the organization. His programs offer a simple, yet effective process that creates a common language and process for strategy to minimize complexities and maximize alignment. Spending time away from the office discussing the broader challenges and possible strategies for your business is so important. The Deep Dive methodology introduced by Rich helped us to focus on the real issues and forced us to have some difficult conversations about our business; but the outputs made it so worthwhile. The whole management team came away with a much better understanding of the strategic direction we wished to take our business. The Strategist Program is a terrific resource for a leader at any level of management. The content is highly customizable and it allows the participant to consider multiple elements of strategy development through an in-depth and critical lens. It also contains several unique resources for assessing the effectiveness of my company’s strategy which I will utilize with my teams as we move forward. Rich does a great job of guiding you through the program in an supportive and realistic way. His command of the content and relevant business experience enables him to relate to the participant with competence and authenticity. The Strategist Program definitively enhanced my professional development and I am a better leader for having worked through it. Thank you, Rich! Rich managed to get us to the heart of strategic thinking in a very short amount of time. He gave us powerful insights on how to embed strategic thinking into our daily activities. Thanks to Rich, my team is reaching another leadership level. Powerful, yet simple, ways to get to think better and have our function lead the company to go to another level. A synthetic and dense, yet simple to grasp, session that has allowed our leadership team to understand how to generate new strategic insights for the company. Having been through several of Rich’s workshops, I continue to take away different pearls each time. His ability to tailor a workshop to the specific needs and language of an organization is appreciated and the entire team consistently feels it is one of the highlights of their training program. Rich challenges people to think differently and to think bigger. He challenges “status quo” thinking that so many organizations fall into and forces you to think outside of the box and more strategically. The Strategist Program is an experience that allows leaders to hone their strategic craft. This program has a unique blend of knowledge, skills, resources and 1:1 conversations with Rich, himself. As a result, any leader can leave the program with the swagger to take on the most complex business situation. I highly recommend this program to any of the following individuals: experienced executives, front-line managers, or even potential leaders that are on the bench anticipating their next move. This program is OUTSTANDING! Thank you for the impactful strategy program that you delivered to our Cardiovascular MSL team today. You’ve helped lay the foundation for the team to start approaching their territories or regions in a more strategic way. I know that I will be referring to your program and your book several times in the coming year as I address our national team. Much appreciated! Thanks for your insight and experience in this critical area of business. “Strategic Thinking” are words you hear often in every business, but rarely do you see a person with the ability to make it simple; you did this for us! You got us to THINK: step-by-step and before we knew it, we were on our way to developing better strategic plans. Great job on the facilitation and learning principles. This was an 8-hr session and it flew by!